« Learn how Your Hands may guide Your Brains to solve a Problem! The people posting these pictures as significant of shizophrenia are the crazy ones! These enlarged loops are significant, instead, for autoimmune diseases such as dermatomyositis, and scleroderma, particularly the latter. Now it’s also possible for scleroderma to affect the nerves, but the primary cause here would be the autoimmune disease, and particular attention should be paid to that FIRST! Thank you for your interesting input, but did you miss the chapter ‘Nailfold Plexus & Other Disorders’…? P.S. The lower set of photos was apparently copied from http://images.rheumatology.org/viewphoto.php?imageId=2862875&albumId=75696 , where they were being used properly to illustrate the effects of scleroderma and dermatomyositis, not schizophrenia. Of course, anyone who believes in palm-reading is loony anyway. Daisy, the photos only serve as an illustration of how various stages of ‘nailfold plexus visibility’ can be recognized – and the second picture is featured with a description which confirms the significance of your knowledge… but not your conclusions! Your first photograph, I’m sure I’ve seen somewhere else before. Your second photograph is stolen from an article at http://dermatology.cdlib.org/DOJvol8num1/reviews/scleroderma/haustein.html concerning scleroderma, and then slightly cropped. Your third photograph is also stolen from at article at http://www.accessmedicine.ca/search/searchAMResultImg.aspx?searchStr=loop+diuretics&searchType=2&fullTextStr=loop+diuretics&resourceID=505&narrowing=yes figure 3, a photo illustrating nail fold capillary microscopy, an another patient with scleroderma. How about if I inform the owners of these pictures of the theft and misuse of them to “represent” something other than what they really represent. I’m sure they’d be livid. You have stolen photographs that show this disorder of capillaries is associated with scleroderma, not schizophrenia. Furthermore the author, Dr. Vuchetich, of the study you cite has since published another study which as nearly as I can tell by the title, retracts the findings of his first one. See http://www.ncbi.nlm.nih.gov/pubmed/19942408 . Deficit schizophrenia is synonymous with negative symptoms schizophrenia. Here’s a definition of the latter: Negative symptoms represent a withdrawal or lack of function that you would usually expect to see in a healthy person. For example, people with schizophrenia often appear emotionless, flat and apathetic. Now I can understand why some patients with scleroderma may have that aspect. The disease is hopeless, debilitating, incurable, ultimately fatal, and it can take many many years to get diagnosed. It took from 1985 until 2010 before I was finally diagnosed, and all the while was made to feel like doctors were not taking my pain seriously. It finally required going to the doctor who 2 weeks later was named 2010 Doctor of the Year by the Scleroderma Foundation. Articles like this one add insult to injury from what is actually an autoimmune disease process. What this doctor SHOULD have done as soon as he saw the nailfold changes is to check the antinuclear antibodies, and then also check to see if such scleroderma-associated antibodies as SCL-70 and anticentromere were present. But he didn’t do that, did he!!!! Sorry, but your comment appears to suggest that ‘nail fold plexus’ can only be observed in patients who have scleroderma. But that is not how ‘body markers’ work at all… for, ‘nail fold plexus’ can sometimes even be observed in healthy individuals! Again, my report does NOT DENY the link between ‘nail fold plexus’ and scleroderma (which you correctly described, but was also mentioned in my report above under the last pictures!!). However, my report focusses on the fact that the same characteristic has also been linked with in schizophrena (especially the negative symptoms). PS. I don’t want to dismiss the significance of the other 2010 report that you mentioned, but since there is plenty of evidence for the link with schizophrenia… one should not draw any conclusions from the title alone. Unfortunately there is not an abstract available, I have no info about how many schizophrenic patients were involved in that study… but in general: it is always possible that a well established link is not confirmed by a sample due to the size of the small sample, etc. I hope my report now will make sense for you as well. PS. Hallie, this study focussed on ‘nailfold plexus’ and connective tissue diseases confirms that nail fold plexus featured with giant capillaries is much more often seen in those connective tissue patients patients (44%) than in controls (0%). OBJECTIVE: To describe and quantify the morphological characteristics of nailfold capillaries that distinguish different forms of connective tissue disease from healthy controls. METHODS: A CCD video microscope with fibreoptic illumination and PC based image processing was used to visualise nailfold capillaries and to quantify findings in 23 patients with systemic sclerosis (SSc), 22 patients with systemic lupus erythematosus (SLE), 21 patients with undifferentiated connective tissue disease (UCTD), and 38 healthy controls. RESULTS: Capillary density was reduced in SSc (5.2 (SD 1.3) capillaries/mm) compared with other patient groups and controls. **The average number of enlarged capillaries/finger was high in all disease groups (5.5-6.6) compared with controls (2). ** However, giant capillaries were most frequent in SSc (43%) and were not present in controls. Mild and moderate avascular areas were present in all groups (35%-68%), but severe avascularity was most frequent in SSc (44%) compared with other patients (18%-19%) and controls (0%). The greatest frequency of extensive haemorrhage was in SSc (35%). CONCLUSIONS: There is a range of abnormal capillary findings in patients with connective tissue disease and healthy controls. 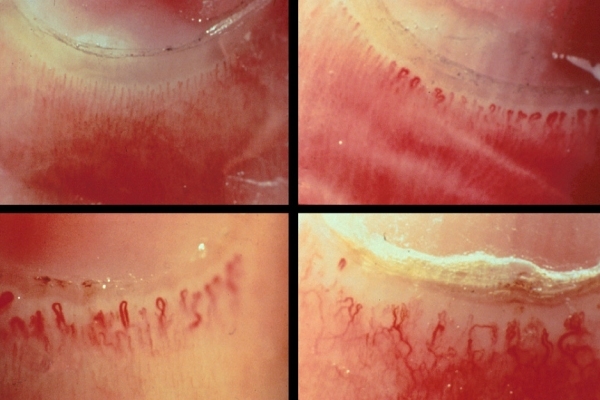 However, certain abnormalities such as a reduced number of capillaries, severe avascularity, giant capillaries, and haemorrhage are most commonly associated with SSc. Videomicroscopy with image processing offers many technical advantages that can be exploited in further studies of nailfold capillaries." My scleroderma specialist says I have definite scleroderma, even though my capillary loops are only “mildly enlarged.” So I still maintain that these doctors should have been running rheumatologic tests on all of these patients found to have enlarged loops. The problem is this: the ACR criteria for diagnosis that were set up in 1980 were designed not for early diagnosis, but rather as a guide for selection of the most obviously sclerodermic patients for purposes of research studies. Therefore it does not adequately diagnose people with limited systemic scleroderma or sine scleroderma who may not yet have developed skin effects, or who in fact (in the case of sine scleroderma) may NEVER develop the skin hardening, even though they DO develop all the same internal fibrosis of scleroderma. So there may be a huge reservoir of undiagnosed people. Dr. Thomas Medsger who has authored over 180 articles and research studies on slceroderma has probably done more research on this than anyone else in the world. It was he who in 2001 before a worldwide symposium of scleroderma specialists proposed that the ACR criteria should be modified to allow diagnosis of early, limited, and sine scleroderma. What he proposed was that nailfold capillaroscopy results, scleroderma-associated antibodies, and Raynaud’s be added to the ACR criteria in order to identify these early cases. Europe, Canada, and Brazil are adopting his modified criteria. Unfortunately the U.S. is slow to do so, because here there is at least one very influential but backward researcher who is opposed to the modifications. By the way, in my approach I always check multiple features of the hand (on multiple dimensions) before considering the possibility of a diagnosis. Which implicates that the presence of a single hand feature nearly always means nothing. 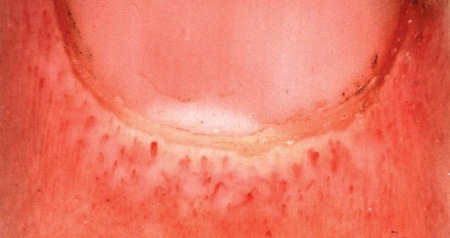 And if ‘nailfold plexus’ is present in a schizophrenia case and a scleroderma case, one will observe other characteristics in the rest of the hand: in scleroderma one can expect skin & vascular problems (such as pitted scars, thickened & hardened patches, Raynaud’s phenomenon), in schizophrenia the features are much more diverse (which may include: motoric problems and various inborn abnormalities). So it will not be hard to discriminate a group of schizophrenics from a group of scleroderma patients if all individuals in both groups would have ‘nailfold plexus’. – while in schizophrenia skin problems are usually not present at all! This example should illlustrate once again the importance of finding MULTI-PERSPECTIVE combinations in order to find a specific hand-diagnosis.